To be able to minimise the technical and economical risks involved in subsea multiphase Pumping, we fully have to understand the reliability aspects involved which are given a brief discussion below. Kvaerner Eureka’s newly developed MultiBoosterTM, is a subsea multiphase pump module of the twin-screw type. 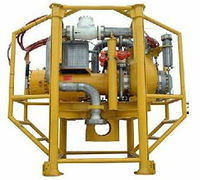 This technology is the most commonly used principle for onshore or topside multiphase pumping due to its reliability and insensitivity to gravity of the pumped medium to generate pressure Dp = f (1/DV), and hence the reason for choosing this technology over conventional helico-axial centrifugal technology. Keeping in mind the “catch 22” phenomenon of the implementation of new technology where Operators hesitate to be the first or the second user of new technological developments which directly may have an impact on the cash flow - before the benefits are fully understood. However, one company has to fully benefit of being the first and at the same time take the calculated risks involved. The importance of the Norwegian Demo 2000 program and in this case; the Fram/Gjøa License with operator Norsk Hydro has played a vital role in bringing to the market new subsea pumping technology together with Kvaerner Eureka as. To minimise the risks involved for the marinisation of field proven onshore technology, the subsea MultiBooster testing has been performed on several levels. From the component tests performed by each of the sub-suppliers to the system tests through integration test to extended FAT (Fabrication and assembly test). Further a detailed checking of interiors of the unit to see that bearings, sealings, cooling and lubrication systems have performed perfectly during the testing. This process is time consuming but necessary and expectations are high. Until extensive experience of MBF (Mean Time between failure) of the subsea pumps are available these simulation will be very valuable and important under the evaluation of new developments. The tool includes the economical evaluation, including capital investment costs, CAPEX, operational costs OPEX and costs related to reduced production due to lost or reduced boosting capability, RAMEX. All the cost elements are combined in a total lifecycle cost model. This lifecycle cost model is established by combining all the information that is generated regarding reliability, intervention requirement, production profiles and investment costs. By using simulation techniques, all the elements are systematically linked together to generate the lifecycle cost for a booster pump development. Subsea multiphase boosting technology has yet to demonstrated it’s claimed merits. The main reason is the uncertainty associated with the operating expenditures and intervention costs related to “unforeseen” events and equipment failures. When moving into deeper water, subsea interventions become more expensive and are associated with longer waiting times for the required intervention vessels and resources. This in combination with the application of new technology, which has yet to be field proven, introduces significant economic uncertainty. To better manage these uncertainties, DNV has, in cooperation with industry partners, developed a procedure to identify, quantify and manage risk related subsea multiphase booster pumping. The methodology is based a systematic evaluation of the system, applying traditional risk and reliability techniques to identify uncertainties, combined with verification services to assure reliability is successfully managed throughout a project. By combining economical parameters and reliability simulation techniques, methods to assist the decision-making process have been established. By applying Monte Carlo simulation techniques, the economical consequence related to equipment failures could be implemented in a total lifecycle cost model. Depending on the system configuration, a failed unit could either result in loss of redundancy or loss of actual boosting capacity. To restore a failed unit, the required intervention vessel will have to be allocated and a new module will be installed or hooked-up to replace the failed unit. The lifecycle cost model will automatically incorporate all cost elements related to any loss in boosting capacity and any costs associated with spread-costs for intervention vessels and spare parts. Depending on the sparing configuration and the maintenance philosophy, the probability of losing boosting capacity can be controlled. Costs related to reduced or lost boosting capacity, could be reduced by investing more money in a redundant configuration. Similar, by spending more money on interventions by recovering all the failed modules will increase the reliability of the system and reduce the potential for loss in boosting capacity. The reliability-based lifecycle cost model allows for optimization and economic evaluation of different configurations and sparing philosophies. An important tool in the process of optimising multiphase boosting is to do actual simulations for both design and operational analysis. Multiphase Boosting can extend field life, give possibilities for development and production of low-pressure reservoirs, and give enhanced and faster production. OLGA 2000, from Scandpower Petroleum Technology, is the market-leading simulator for transient multiphase flow of oil, water and gas in well and pipelines with process equipment. OLGA 2000 is being widely used for feasibility studies, design, operational analysis and modifications of facilities, procedures and controllers. 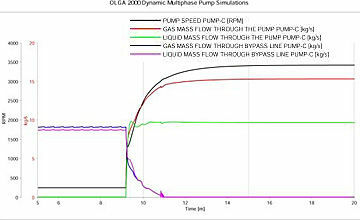 A multiphase pump module has been implemented in the transient multiphase flow simulator OLGA 2000. The module gives the opportunity to do detailed simulation of centrifugal and displacement pump. 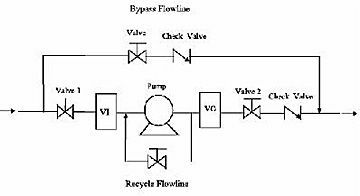 The pump model consists of either a centrifugal pump or a displacement pump, a recycle flow line, and a bypass flow line. The pump characteristics are defined through the pump data tables. A complete set for both types of pumps are included in the code. However, the users can easily change these data by specifying their own pump data tables. The pump speed and recycle flow can be regulated by controllers. The user can choose the recycle flow as gas only, liquid mixture, water only, or fluid mixture. The bypass and recycle flow lines are simulated by using controlled mass sources at each side of the pump. The bypass flow line is modelled so that no back flow is allowed. 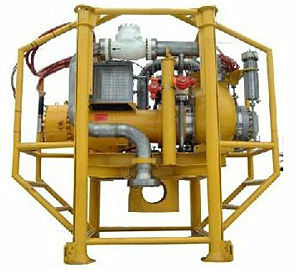 A common multiphase transportation system with pump is shown below. An actual simulation of a multiphase pump gives the following result, shown in a trend plot.